Video of the underwater exploration of the wreck of the 18 April 2015 shipwreck which cost the lives of more than 800 people, onto which a crown of flowers was placed. Credit: Impresub/Marina MilitareAs of the end of April 2016, the Italian Navy has deployed four ships to fish out the wreck of a migrants’ boat from a depth of 370m and retrieve the bodies of the several hundred migrants who remained trapped inside since the night of the 18th of April 2015. Following a collision between the migrants’ severely overloaded vessel and a 147m cargo ship that had approached to rescue it, the boat capsized, causing the death of more than 800 people – the largest shipwreck in recent Mediterranean history. Italian authorities described this endeavour as a “duty”. “We cannot close our eyes in the face of this momentous tragedy”, Italian Prime Minister Matteo Renzi declared. At first sight, retrieving the bodies of the dead so as to help their families to elaborate the trauma of loss and to mourn their loved ones appears as a deeply humane action. Having interviewed the survivors of this tragedy, and having worked in the past with numerous families of those disappeared at sea in support of their quest for truth and justice, we certainly have the deepest respect for the pain of migrants’ families and support initiatives that may alleviate it. However, upon closer scrutiny, the operation of retrieving, commemorating and mourning proves to be deeply problematic and hypocritical. For this tragic loss of life was not an unfortunate “accident” but the result of political decisions taken, amongst others, by the very state actors who are now claiming a high moral ground by recovering and mourning the dead. First of all, the 18th of April shipwreck is only one among many more incidents that have led to more than 22,000 documented deaths at sea over the last 25 years. These have been the structural product of EU migration policies that have denied legal access to EU territory to the impoverished citizens of the global South since the end of the 1980s. The militarization of border controls and their externalization to North African states has forced migrants wishing to reach EU territory to resort to smugglers and to take longer and ever more dangerous routes. Italy, as a “frontline” state of the EU, has for many years been a pioneer in these practices, and as such is deeply enmeshed in this deadly migration regime. 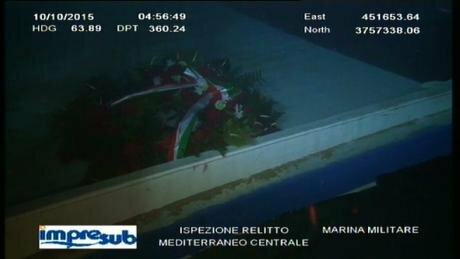 But the responsibility of the EU and Italy, in particular for the loss of lives in the 18th of April shipwreck, lies not only in these long standing policies, but in a series of precise operational decisions that created the conditions in which this shipwreck was only waiting to happen. In our recent report “Death by Rescue: The Lethal Effects of the EU’s Policies of Non-Assistance”, we have reconstructed in detail this particular shipwreck and the sequence of policy decisions that made it ineluctable. Following the October 3rd 2013 shipwreck in which 366 people died less than 1km from the island of Lampedusa, Italy launched the “military and humanitarian” Mare Nostrum operation, deploying a record number of ships to rescue migrants in distress very close to the Libyan coast. Mare Nostrum, however, soon came under increasing attack for allegedly constituting a “pull-factor” and was terminated at the end of 2014. As of the 1st of November 2014, the Triton operation led by Frontex, the European border agency, was launched instead. This operation deployed fewer vessels in an area further away from the Libyan coast. Border control instead of rescue was its priority. While policy makers hoped that removing Mare Nostrum would act as a deterrent to stem crossings, the lethal effects of this decision were not only vocally denounced by human rights advocates such as Amnesty International, who argued that as long as the conditions that were leading to crossings were in place “people will attempt the crossing, with or without Operation Mare Nostrum in place. But without it, many, many more will die.” Even Frontex, in a document preparing for the Triton operation, assessed that “the withdrawal of naval assets from the area, if not properly planned and announced well in advance, would likely result in a higher number of fatalities.” Prioritising deterrence over migrants’ lives, Frontex and EU member states pushed on with the implementation of a more limited operation in full knowledge of the lethal effects this would have. The reality that began to unfold in early 2015 proved the human rights community right. 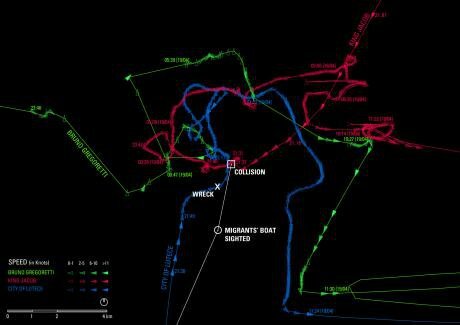 Migrants’ crossings continued unabated, but instead of a fleet of state-operated vessels a lethal Search and Rescue gap awaited them. Several boats were reached too late, left adrift for days, or never found at all and in the first two months of 2015, the danger of crossing grew 30 times compared to the same period of the previous year. Seeking to fill this gap, the Italian Coast Guard increasingly called upon merchant ships transiting in the area to carry out rescue operations, thereby partially privatising rescue. The rescue of migrants’ overcrowded boats can easily lead to tragedies if not operated with the most adapted means and standards, as the shipping industry had repeatedly denounced. Following a new incident in which more than 30 people died when a boat capsized as its passengers were attempting to climb onboard an offshore supply vessel that had come to rescue it, the shipping community warned once more in the clearest possible terms of the looming catastrophe: “Commercial ships are not equipped to undertake such large-scale rescues […] There is a terrible risk of further catastrophic loss of life as ever-more desperate people attempt this deadly sea crossing.” All these signals and warnings went unheeded and the predictable and predicted catastrophe materialized, not once, but twice. On the 12th of April, a first large scale shipwreck occurred just as a supply vessel was approaching to rescue the passengers of an overcrowded fishing boat. The crew onboard the supply vessel did not possess the specific know-how necessary to prevent the capsizing as the passengers panicked at its sight and their movement made the boat turn over, leading to the death of more than 400 people. The 18th of April shipwreck too occurred at the very moment the King Jacob, a 147 meters long container ship, sought to rescue a boat loaded with more then 800 people. This time the driver of the migrants’ vessel collided with the side of the cargo ship. The impact barely left a mark on the side of the large container ship, but was enough to make the migrants’ boat sink within minutes. Only 28 people could be rescued. In both these cases, while the captains and the crews of the merchant vessels involved appear to have done all that was in their power to rescue the passengers in distress, it is clear that the retreat of state-led search and rescue operations decided by the EU and its member states had left merchant ships to bear a burden that was too heavy for them to carry, further endangering the lives of migrants. On the 29th of April 2015, the President of the European Commission, Jean-Claude Juncker, admitted that “it was a serious mistake to bring the Mare Nostrum operation to an end. It cost human lives.” However, the ending of Mare Nostrum and its (non-) replacement by Frontex’s Triton operation, cannot adequately be described as a “mistake”. While this policy was implemented in all knowledge of its deadly outcomes, it must be characterized as an act of killing by omission. One year after this human tragedy, the military ships that had been removed from the maritime space off the coast of Libya thereby contributing to create the conditions that would lead to this cataclysmic loss of life, have been re-deployed to fish out the dead. But inscribed within this sequence of events, the fishing out of the 18th of April wreck appears in a new light: the scene of the spectacle of compassion only serves to hide the obscene lack of accountability for these deaths, the lack of justice for the survivors and their families, and the perpetuation of policies leading to deaths at sea. Those military ships would have in fact been better used not only to prevent this tragedy from occurring in the first place, but also to avoid its subsequent repetition. Only a few days after the first attempt to retrieve the wreck, several successive shipwrecks occurred in the same area. In the 26th of May 2016 shipwreck, a boat that left the Libyan town of Sabratha had started taking in water and was being towed by another one. Alerted to their distress, the Alarm Phone immediately informed the Italian Coast Guard, but due to the limited number of rescue means in the area it took more than four hours for rescue to reach the location of distress. After two hours, the boat being towed sank with more than 550 people on board. While the EU and its member states seem capable of caring for migrants only when they are dead - the posthumous citizenship offered to the victims of the 3rd October shipwreck being another powerful example of this disturbing trend, it is high time for EU member states to give rights to migrants while they are alive, not once they have been killed by their policies. The EU has a number of policy tools to resort to in order to respond to the movement of people unleashed by a region in turmoil – for which Western states bear a high responsibility in the first place in terms of their past and present policies. These include ambitious resettlement programmes, the lifting of carrier sanctions and a substantial relaxation of visa restrictions, with the longer term aim of a policy that would offer a legal framework for human movement across borders to occur legally and safely, rather than seeking to block it selectively. 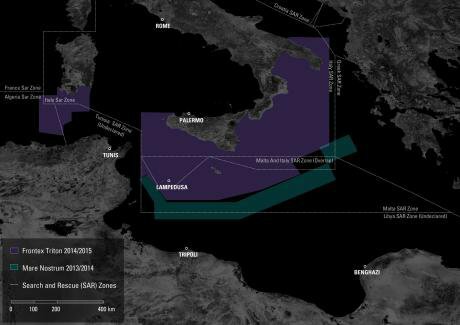 Synthetic map and figures of the situation in the central Mediterranean, June – September 2015. Credit: Forensic Oceanography. GIS analysis: Rossana Padeletti. Design: Samaneh MoafiHowever, this shift in course is far from taking place. While we could have expected that following Juncker’s partial admission of guilt, the actors responsible for what he termed a “mistake” would have faced serious consequences, the very agency that had played a leading role in shaping this policy choice, i.e. Frontex, saw its budget trebled. Frontex’s expanded operation was joined by the deployment of the EU’s military operation EUNAVFOR MED against smugglers and traffickers – now labelled the “slave traders of the 21st century”. Both these operations have security concerns rather than rescuing migrants at the core of their mission. Shifting the blame onto smugglers and traffickers only serves to perpetuate the very policies that force migrants to resort to them in the first place. 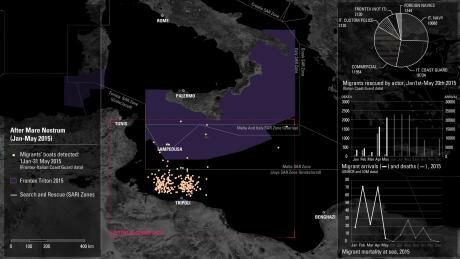 Despite the deployment of a nongovernmental humanitarian flotilla, the central Mediterranean remained the most dangerous area of crossing. The single event that succeeded in making the Mediterranean crossing significantly safer following the April 2015 shipwrecks has been Syrian’s collective change of route from the central to the eastern Mediterranean as of May 2015, that is, from a longer and much more dangerous route to a much shorter and relatively safer stretch of sea. While this diminishes neither the tragedy of every life lost nor the hardships migrants have faced once on firm land, this trend has been remarkable in leading to the lowest mortality rate in the last 15 years. But even this limited positive trend is currently being reversed by the EU’s and its member states’ readiness to close by any means necessary – including the most violent – the spaces of freedom of movement opened by migrants’ struggles across the “Balkan route” in summer 2015. Under pressure from the EU and instrumentalising migration towards its own political ends, Turkey imposed tougher controls in the Aegean as of the end of 2015 – which unsurprisingly have coincided with increasing cases of deaths. 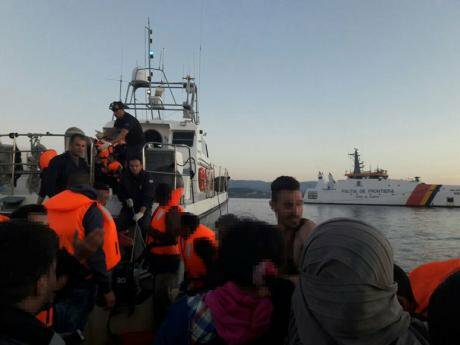 Following the infamous March 2016 EU-Turkey “deal” which has aimed at deporting back to Turkey all illegalised migrants arrived in Greece, crossings in the Aegean have all but stopped and those who have attempted it have been at risk of push-backs. Photograph taken by illegalized migrants during their push-back by the Greek Coast Guard to Turkey, documented by the WatchTheMed Alarm Phone. In the background, a vessel of the Romanian Coastguard operating within the Frontex mission can be seen. 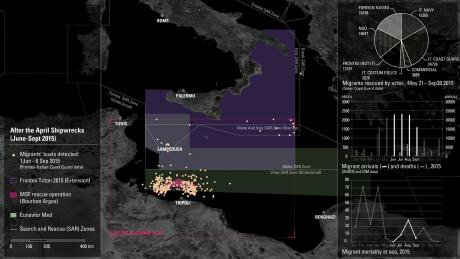 Since the conditions that have led to large scale crossings of the Mediterranean continue to be in place, it was to be expected that the closure of the Aegean would lead to the splintering of migrants’ routes and a return of the central Mediterranean as the main area of crossing. While only few Syrians have returned to this route so far, Syrians were among the casualties of the 26th of May 2016 shipwreck. With increasing arrivals in Egypt of Syrians entering through Sudan recorded by the UNHCR over the last months, the intensification of this trend is probably only a matter of time. With or without its confirmation, crossings of the central Mediterranean which have continued unabated are more dangerous than ever, and we can expect 2016 to lead to new records in deaths at sea. As the EU’s delusional policy of deterrence is perpetuated, the only hope for seeing an end to the soaring number of migrants’ deaths at sea this year is for EU institutions, EU citizens and migrants alike to block the EU-Turkey deal and re-open the safer Aegean crossing. The decision of the Greek court that ruled on the 20th of May the deportation of Syrians to be illegal as it would violate the Geneva Convention was a first important step, but only three weeks later Greece has been pressured to change the composition of its appeal committees. In this move we can see the confirmation of the tendency towards the troikazation of migration management – in which the policies of southern European states are dictated by EU institutions and northern European states – and the readiness of the EU to suspend fundamental principles of sovereignty, democracy and the rule of law to achieve its ends. We await to see which signal the European Court of Justice will give in response to the several cases that have been filed. If the EU-Turkey deal is not blocked through institutional means, then all that will still stand in its way will be the acts of civil disobedience such as those enacted by activists by blocking the Frontex operated ferries on their route to Turkey with their very bodies, and forms of direct support to migrants’ illegalised crossings through the work of the numerous NGOs and activists who have, since summer 2015, transformed the Aegean islands into a new laboratory of transnational solidarity. The re-opening of a safe(er) passage through the Aegean is a matter of life and deaths for thousands of migrants, and an urgent response to revert the self-destructive course the EU is heading in. For as long as migrants will drown, Europe will keep sinking.